​Everyone recognizes 'the faces on the mountain,' Mount Rushmore and the Crazy Horse work in progress sculpture, in South Dakota. But there is much more to South Dakota, as a state, they have embraced sculpture, made by humans or Ma Nature, on a much wider scale. There are excellent public art displays in all corners of the beautiful, big and sparsely populated state. Sioux Falls sits on the very eastern tip of state and it initiated the excellent SculptureWalk in 2004. 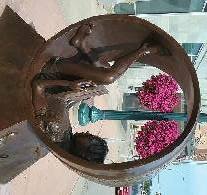 Each year they display approximately 40-60 sculptures throughout the downtown area. All the sculptures are for sale during the year and the organization actively promotes them. In the first five years approximately 63 sculptures sold and 18 sculptures were leased. SculptureWalk is a non-profit volunteer organization and all money raised goes directly into the program. The public vote throughout the year for their favorite and at the years end, the city buys the winner of the public vote, which is then placed in a permanent position in the park around the falls or downtown. It is truly uplifting to see a city support a project like this and to see the high level of work submitted. The city produces an excellent brochure featuring a walking tour of the sculptures each year and docent tours are available for groups of 6 or more. More information can be obtained online or from the visitors center at the Chamber of Commerce downtown. Further to the West the vast natural wonder, Badlands National Park, easily classifies as a sculptural marvel. Spend a day or a week driving or hiking in this area and you will not be disappointed. Intricately woven canyons dig deep down in to earth revealing orange and yellow strata and the towering cliffs with a base of white sand and bright yellow bushes need no more adornment than the flash of green shrubs, perhaps a big horn sheep or a couple of pronghorns. On the very Western edge of the state the smaller Rapid City is not to be outdone. Their nickname, "the Presidents city,' is self explanatory - they have life size sculptures of all the American presidents placed downtown. You can stroll along and take your photo with every single one if you like, or just your favorites. The library has an evocative sculpture of a woman reading to children and a couple of fun Seuss characters placed around the pavement. One of the large galleries downtown, Prairie Edge, has an excellent sculpture of a Native American woman and child at the entrance to the gallery. Now the city has another innovative and unusual program, the remarkable Sculpture Project, in a central square downtown. In 2011 Destination Rapid City replaced an old parking lot in the center of downtown by turning it into the Main Street Square and launched the Sculpture Project. They put out a call to artists and received 88 applications. The following year they announced the selection of Masayuki Nagase out of Berkeley Calif., as the project artist. Nagase proposed a body of work entitled 'Passage of Wind and Water.' Each year he spends the summer working on the large sized pieces placed around the square. The public can watch his progress and he holds artist talks to explain his process and ideas. Mount Rushmore National Memorial and the Crazy Horse monuments are located in the Black Hills area, one of nature's beautiful places. Custer State Park is included in this area, it is large and needs time to explore and it shouldn't be missed. Natural sculptures abound around every breathtaking corner, especially along the Needles drive. Small towns like Hill City dot the area and they too have adorned their streets with sculptures, mostly made from found objects or scrap metal. Naturally, as it's a Western state, horses feature often.